Before I start diving into the Holiday cooking, I wanted to share my creation for this week's Stamp Ink Paper color challenge. As we are approaching the holiday seasons, I thought this color combination would be a bit challenging to incorporate - and I was right! Although these colors aren't your traditional colors for Christmas, I thought I would give it a whirl. I love how it turned out. The most time consuming part was coloring in the holly leaves and berries with my blender pen. Definitely not a card that you can mass produce with limited time, but perfect for that special friend or family member. I used the Stampin' Up Peaceful Wreath set from the Holiday catalog along with the Wonderful Wreath Framelits. The basic black background of the card really accents the Cucumber Crush and Watermelon Wonder colors. I hope you have enjoyed my creation and will join in the fun and creativity. As always, any items created on my page are available for purchase. If you want to get your craft on and create this card yourself, I have listed the supplies below for your convenience. As always.... Happy Stampin'! Wow Kim! You rocked this challenge! I absolutely adore this card! Your banners and beautiful wreath really pop against that black background! Love your linen thread bow on the wreath too! Thanks so much for joining us at SIP for our color challenge this week! Gorgeous card Kim! That wreath is beautiful and it really pops against the black background. So glad you joined us this week at Stamp Ink Paper! Gorgeously done! Perfect way to use the challenge colors. 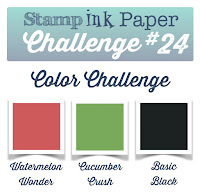 Thank you so much for joining our Color Challenge at Stamp Ink Paper this week.